This eLighthouse report on AACPS’s use of government resources for political activity is based on a series of Public Information Act requests. It focuses on one case study: student grassroots legislative lobbying orchestrated by AACPS staff using AACPS resources. 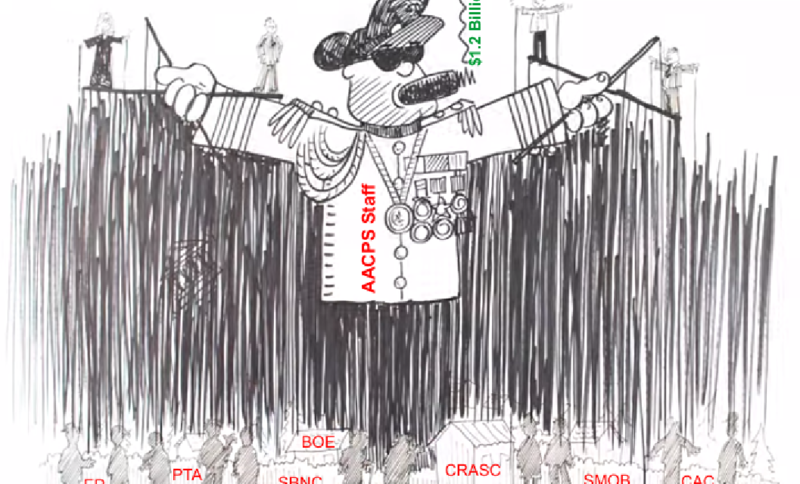 The cover cartoon, which depicts AACPS staff control of the key democratic institutions that are supposed to make AACPS accountable to the public, attempts to capture the scope of the problem, which has been the subject of dozens of articles posted on eLighthouse.info. Ed Reilly claims to have been making a statement about public policy but the only real statement he made was about how he is a condescending jackass with no sense of accountability towards his district.